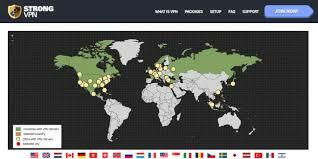 StrongVPN is among the leading VPN service providers in the world. It’s invaluable for providing anonymous surfing and total security to its users. StrongVPN is a sister company to Reliable Hosting, an American company that was established way back 1994. It has one of the best customer support team in the industry. The VPN is famous across the world, and its popularity is growing by the day. In our review, we delved deeper into research to inform you the fundamental features inherent in the VPN. We also point out the pros and cons of the StrongVPN to assist you in making a knowledgeable decision when you decide to purchase the best VPN service. Complete online security and privacy – You can navigate quickly around censorship thus unlocking local content. StrongVPN is highly effective in China. Zero logging policy – They don’t store a client’s logging activity on their servers. Servers in 45 cities in 21 countries across major continents. Unlimited bandwidth – you not only browse the internet, but you can also download data. StrongVPN features an elegant, user-friendly interface. You can download the client software for free from their website. The interface is easy to use. All the options are readily available, and you can access every section you desire through simple clicks. The company has its main base at Digital Realty Trust in San Francisco. They have a strong network of servers that spread in the main continents across the world. Currently, they have 600 VPN servers in 45 cities across 21 countries that support 87,000 IP Addresses around the world. In Europe, they have over 170 servers in 24 cities. In North America, they have more than 380 servers in 17 cities. In South America, there are two servers in Mexico City. In Asia, Strong VPN has 25 servers in 6 cities. The network of servers is undeniably impressive for an individual VPN company. StrongVPN is compatible with a broad range of devices that run on Windows, MAC, IOS, LINUS, Google Chrome and many others. The VPN also supports mobile devices i.e. iPhone, iPod, Touch, Android, and Windows mobile. The setup page provides a comprehensive list of tutorials for a broad range of supported platforms and devices. Other supported platforms are Ubuntu, bada, hpWebOS and S60 Symbian. Support is also available for DD-WRT Routers, Tomato USB, Sabai OS and Mikrotik routers. To install and setup StrongVPN, you must download the client software from their website. They provide free setup tutorials for different platforms. StrongVPN provides automatic setup applications for Windows, MAC OSX, IOS, and Android. Downloading and setting up the client software is easy. The StrongVPN client setup wizard installs the client software on your device. During the installation, it is advisable to close all other applications. Installation takes place in seconds. After installation, you can proceed to launch the StrongVPN. The client provides two login fields one for the email and another for the password. The client interface is user-friendly and provides a drop down menu where you can select your location of choice. OPENVPN – Highly secure 256-bit encryption (with up to 2048-bit available) and data authentication via digital certificates. OPEN VPN offers high speeds on networks notwithstanding instances of high latency. PPTP – Features a primary 128-bit encryption. Its low-level encryption enables it to have the highest speeds compared to other protocols. L2TP – has 256-bit encryption. It has lower speeds than PPTP as a result of the added security and encryption. IKEv2 – Features Advanced Encryption (AES) 256 which provides extremely high speeds and can re-establish connection after the loss of internet connection. It supports the mobility and multi-homing (MOBIKE) protocol which provides security to mobile users. The choice of which protocol to use depends on issues like your location and the server location. Choosing a server near your location is known to provide high speeds. The price of a VPN is important as it plays a central role in attracting subscribers to a VPN. Customers are constantly in search of a VPN service that offers high performance coupled with competitive pricing. StrongVPN has two main pricing plans on offer. They offer a monthly plan that is priced at $10 per month and a 12 months plan priced at $ 5.83 per month for a 12-month plan. Signing for a 12-month plan will save you 41% off the regular monthly payment. We noticed that all the plans come with a five-day money-back guarantee. Both plans will give you access to 600 StrongVPN servers in 22 countries and also PPTP, L2TP, SSTP, OPEN VPN and IPsec. Protocols. StrongVPN provides round the clock high-quality customer support. They have one of the best customer supports in the industry. Customer support staffs are highly experienced and have worked together as a team for a long time. Support is provided through Skype, email, and voice mail. A support form is also available whereby you type a short description of the problem that you may be facing, and an experienced customer support staff contacts you promptly. Other features of strongVPN that we liked are the use of Team View remote set up that enables a StrongVPN customer service staff to install the VPN client to your device remotely. We also liked the fact that customer support is available in different languages. You also get invaluable tutorials and a comprehensive FAQ on StrongVPN official website. Payment options are an important factor to consider for it can limit the number of subscribers willing to purchase a VPN service. StrongVPN accepts almost all top payment methods available in the market. Some of the options are credit cards, wire transfers, PayPal, and Bitcoin. Acceptance of Bitcoin is a plus as it is a cryptocurrency that’s pseudo-anonymous. It is not easy to trace a subscriber who uses Bitcoin. This makes Bitcoin most ideal for those who require complete anonymity. 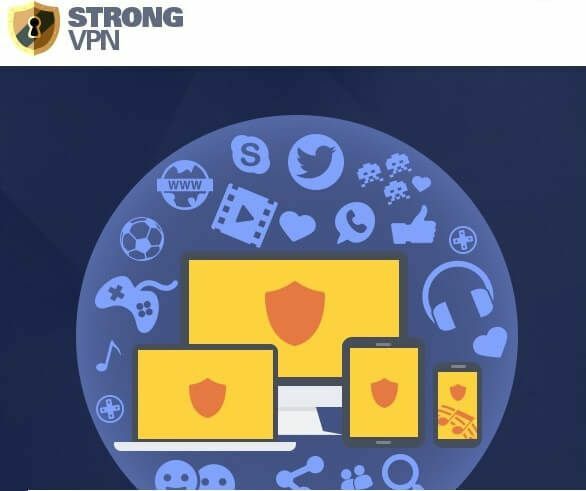 Other features that make StrongVPN a favorite for many subscribers are the availability of StrongVPN guides for all protocols, Protection by Virtual Firewall, Encrypted traffic, and the fact that the IP is Not your real IP Address. Privacy is also an important feature. StrongVPN keeps your online activity, identity and locations are strictly private by encrypting your data and routing it through remote servers. Speed is another great feature of StrongVPN. Slow speed is annoying to most VPN users. We carried out various speed tests on different server locations, and we can submit without fear of contradiction that StrongVPN has great speeds compared to many other service providers in the market. 5 – Day money – back guarantee. StrongVPN is a popular VPN service provider that has invested a lot of resources in customer service. The company has consistently expanded its server locations to 45 cities in 21 countries. The servers are spread in different continents which mean great speeds for users in various parts of the world. StrongVPN provides Smart DNS service to unlock websites and streaming. They use OPEN VPN as their primary protocol which is a very secure protocol. Their availability on mobile phones such as iPhone, iPod, Touch, Android and Windows phone has played a significant role in their capturing a larger market share since more and more people are accessing the internet through smartphones. StrongVPN’s location in San Francisco in the United States is advantageous in that it allows them to sell bandwidth at a lower rate. However, a US location is unsuitable for a VPN service provider as US laws can change anytime on logging and anonymity. StrongVPN is continuously reinforcing its systems towards becoming a market leader in the VPN service provision industry. It is a VPN service provider with a well thought out growth strategy that places customer service at the heart of their operations.